The Fairway golf cart enclosure fits four-person golf carts for fast and portable protection against wind and rain. 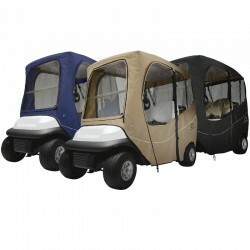 It fits over the roof of carts with or without windshields. 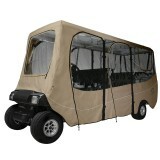 No tools or drilling required. In addition to fitting standard 4 passenger golf carts, these enclosures can also be used with pre-2007 Club Car, EZ-GO and Yamaha Carts with or without windshields (with standard factory roofs only). The Fairway Deluxe golf cart enclosure fits six-person golf carts for fast and portable protection against wind and rain. 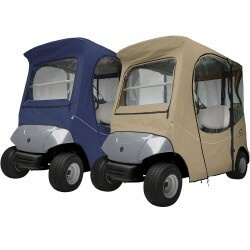 It fits over the roof of carts with or without windshields. No tools or drilling required. Custom Fit for Club Car i2 Two-Person Golf Cars. The Fairway Fadesafe Drive golf cart enclosure fits two-person Club Car golf carts for fast and portable protection against wind and rain. 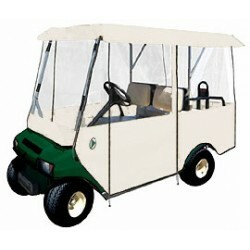 It fits over the roof of carts with or without windshields. No tools or drilling required. 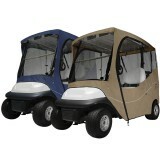 Custom Fit for Club Car i2 Four-Person Golf Cars. 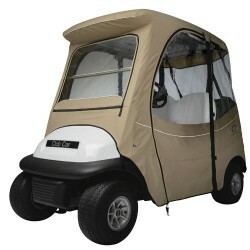 The Fairway Fadesafe Drive golf cart enclosure fits two-person Club Car golf carts for fast and portable protection against wind and rain. It fits over the roof of carts with or without windshields. No tools or drilling required. Custom Fit for The Drive By Yamaha Two-Person Golf Cars. 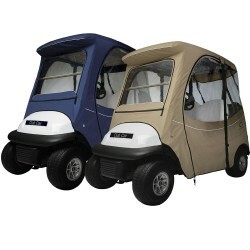 The Fairway Fadesafe Drive golf cart enclosure fits two-person Yamaha Drive golf carts for fast and portable protection against wind and rain. It fits over the roof of carts with or without windshields. No tools or drilling required.